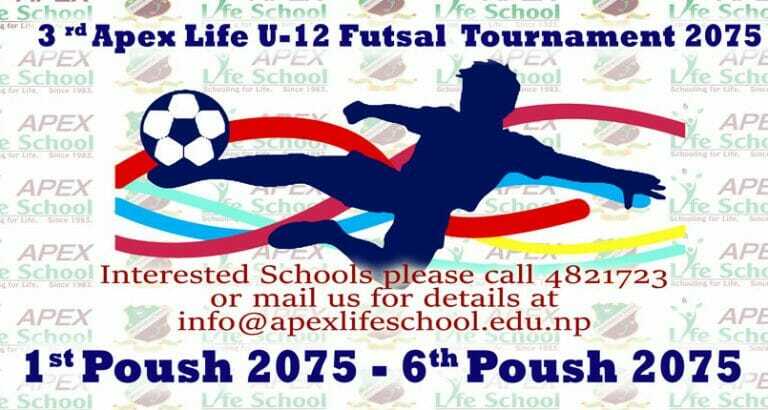 Once again it is a pleasure and privilege to invite your venerated institution to our school to participate in the “3rd APEX LIFE INTER SCHOOL U-12 FUTSAL TOURNAMENT”, a cornucopia of talent and sportsmanship, to be held in the school premises from 1 Poush 2075 (16 December 2018) till 6 Poush 2075 (21 December 2018). This competition is held every year to hone the intrinsic and latent abilities in pupils and demonstrate their inherent talents. Details and registrations forms are available for download. Last date of registration 28 Mangshir 2075 (14 December 2018).